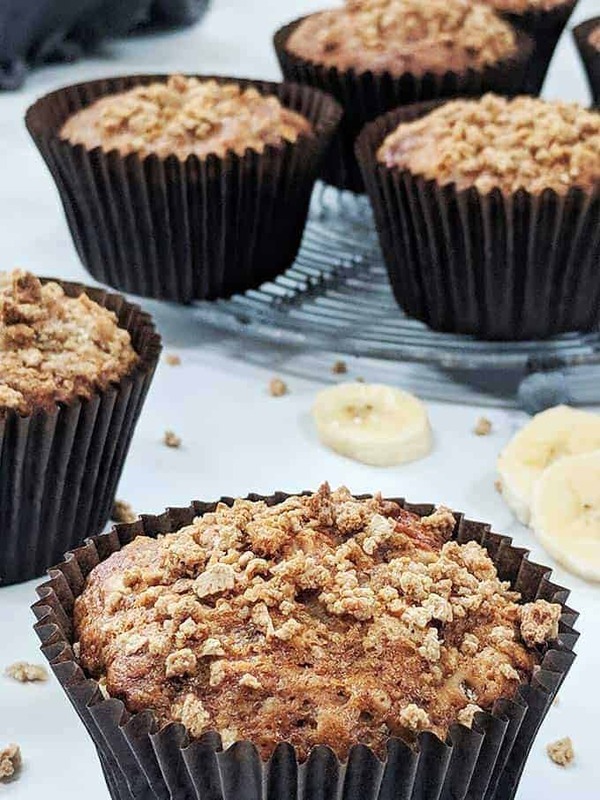 If you’re looking for a low SmartPoint sweet treat, then these Banana Muffins with Streusel Topping are perfect. 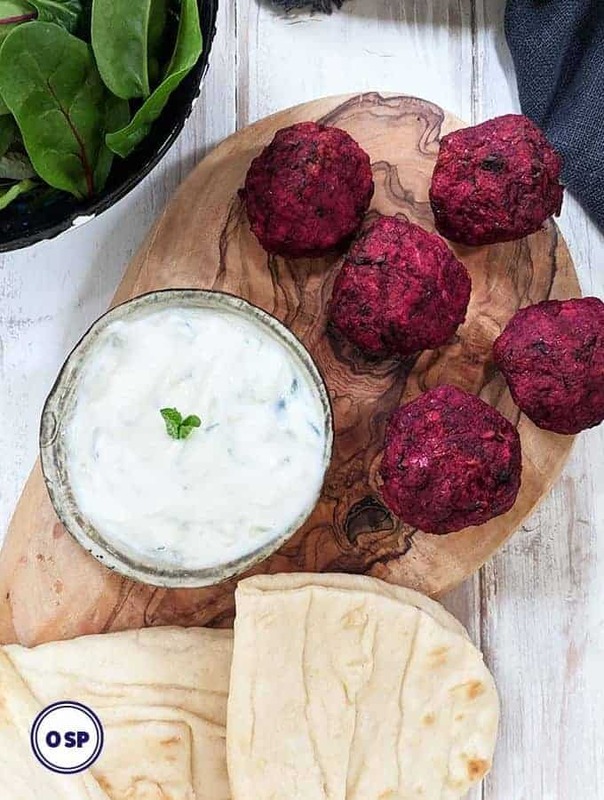 Easy to make and just 4 SmartPoints per muffin on Weight Watchers Freestyle plan. They freeze well or can be stored for up to 4 days in an air tight container. Who doesn’t like a good muffin? But … muffins can look all sweet, innocent and healthy but in reality they can really pack the fat and sugar! 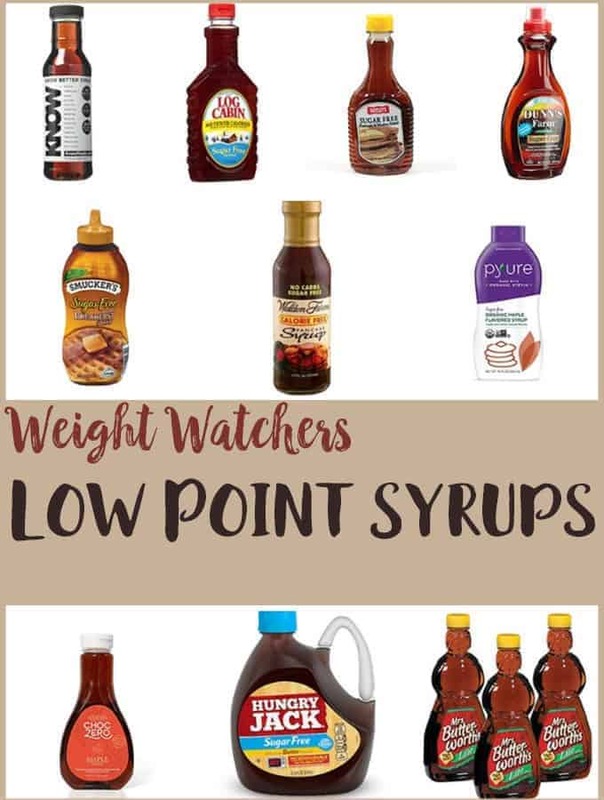 And following the Weight Watchers plan, that’s not really what we want as fat and sugar ratchet up the SmartPoints value. For example, a Starbucks Lemon Poppyseed Muffin will set you back a whooping 19 SmartPoints! Even one of Starbuck’s Skinny Blueberry Muffins is 12 SmartPoints per muffin! I like muffins, but I don’t know whether I like them 19 SmartPoints much!!! I had made these 5 SmartPoint Blueberry Muffins a couple of months ago and was delighted with the results. So, I decided to make another lower SmartPoint muffin recipe and came up with this. 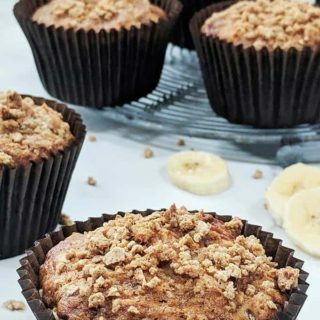 These Banana Muffins have the tasty addition of a lovely sweet, crunchy streusel topping! Yum! 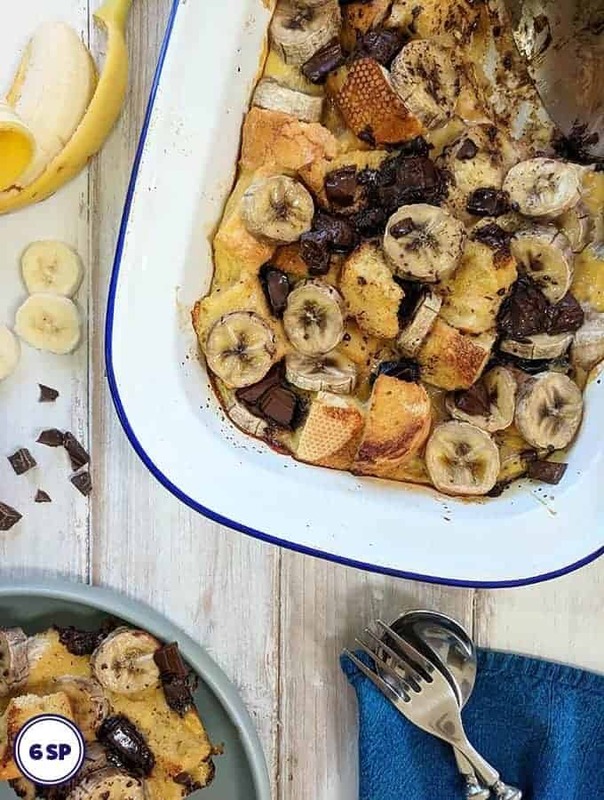 The ‘streusel’ topping is made with grape-nuts, a little sugar and a bit of cinnamon – fewer SmartPoints than a normal streusel topping of butter, sugar and flour! If you haven’t heard of grape-nuts before, just a heads up, they contain neither grapes nor nuts! They are actually made with wheat and barley. If you haven’t tried them before then you are in for a treat especially if you like a bit of added crunch to your food. I often add a teaspoon of grape-nuts to a bowl of fat free Greek yogurt along with a drizzle of honey, for a really tasty low point breakfast. You can find Post Grape-Nuts in the breakfast cereal aisle at most large supermarkets. 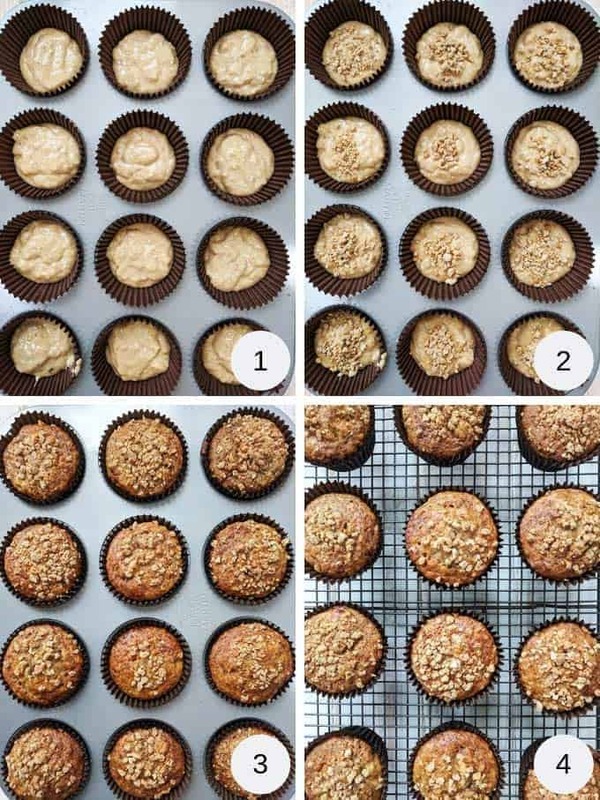 This recipe for Banana Muffins is enough to make 12 muffins. To prevent the muffins from sticking to the case, use good quality paper cases. Add the oil, egg and fat free yogurt to the mashed banana (picture 2) and using an electric whisk, beat until the mixture is combined. Add the vanilla paste, honey and sugar to the mixture (picture 3) and whisk to combine. You can then add the flour, baking soda, salt and cinnamon to the wet mixture (picture 4) and use a spoon to gently fold the dry ingredients into the wet ingredients. Don’t over mix the batter as this will result in dense muffins. However, you do want to combine the mixture until there are no ‘pockets’ of flour left. You will be left with a smoothish batter (picture 5). I use a heavy gauge metal muffin tin as I find that this helps muffins cook evenly. When I have used cheaper / thinner muffin tins, I have found that the muffins can become tough and chewy and over – baked on the bottom whilst still a bit wet in the middle! I use an ice cream scoop to scoop the muffin batter into the muffin cases. Fill the cases approx half full of mixture (Picture 1). The muffins will rise to fill the case. Sprinkle some of the streusel mix on top of each of the muffins (Picture 2). I used approx 1/4 – 1/2 a teaspoon of mixture per muffin. Bake until the muffins have risen, are golden brown (Picture 3). Use a cake tester (or a tooth pick) to pierce the cupcake. If the cake tester comes out clean then your muffins are ready! I use an electric whisk, like this one available from Amazon, to whisk the ingredients to a smooth batter. I use a good quality, heavy 12 hole muffin tin to bake these muffins, similar to this one. 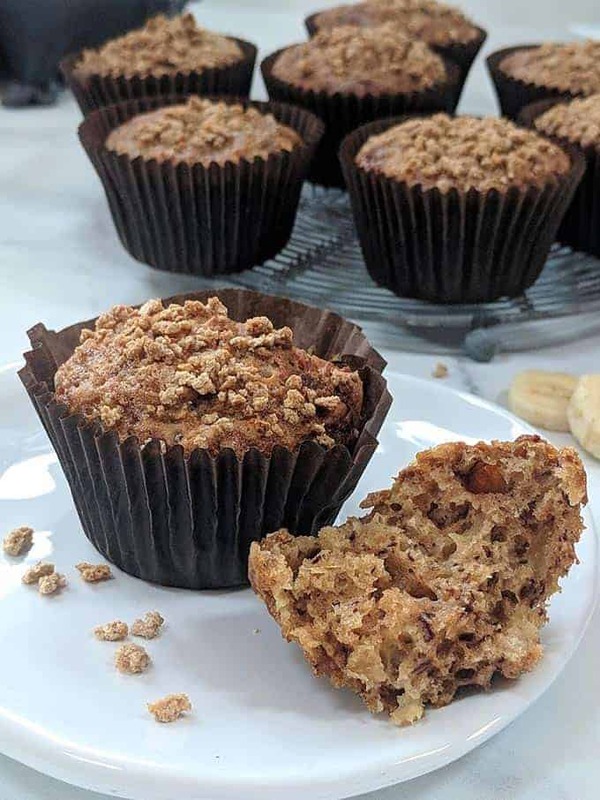 As above, I use Post Grape-Nuts to make the streusel topping for these banana muffins. They are available at most large supermarkets, or can be purchased from Amazon. The muffins can be stored at room temperature in an airtight container for 3 – 4 days. For best results I would suggest lining the air tight container with a couple of sheets of paper towel, placing the muffins on that and then covering the muffins with another layer of paper towel before putting the lid on. The streusel topping will lose it’s crunch over time (as it draws out the moisture from the muffin) but they still taste delicious! If you are wanting to store the muffins for longer than 3 or 4 days I would suggest freezing them – see below. 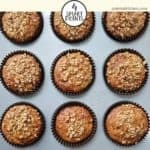 Can I freeze these Banana Muffins? For best results freeze the muffins (once they are cold) in individual plastic freezer bags. That way they can be removed from the freezer one by one when needed and thawed at room temperature. 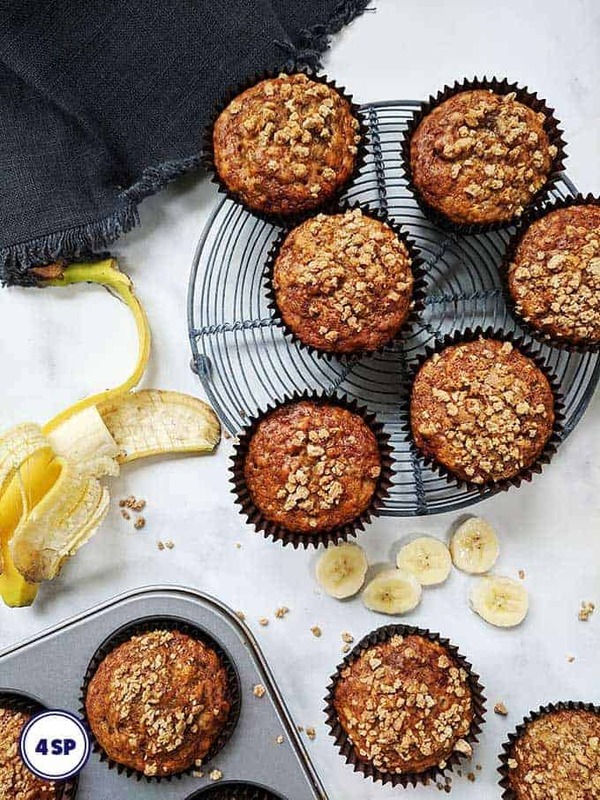 These simple to make, healthy banana muffins have a sweet & crunchy streusel topping. 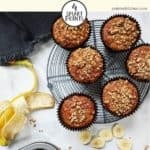 They are 4 Smart Points per muffin on Weight Watchers Freestyle plan. Preheat the oven to 180oC / 160oC Fan / 350oF. Line a 12 hole muffin tin with paper cases - set aside. Place the grape-nuts in a small bowl and stir in 2 teaspoons of the sugar and 1/2 teaspoon of the cinnamon. Set aside to use later. Mash the bananas in the bottom of a large mixing bowl. Add the egg, yogurt and oil and using a hand whisk, mix together to get a smooth mixture. Add the sugar, honey and vanilla paste and whisk until combined. Add the cinnamon, baking soda, salt and flour and fold into the wet mixture using a metal spoon. You want the mixture to be incorporated so that there are no 'pockets' of flour left but don't over mix the batter. Spoon the mixture into the cases and use 1/4 teaspoon of the grape-nut mixture to sprinkle on top. Bake for 20 - 22 minutes until the muffins have risen and turned golden brown. 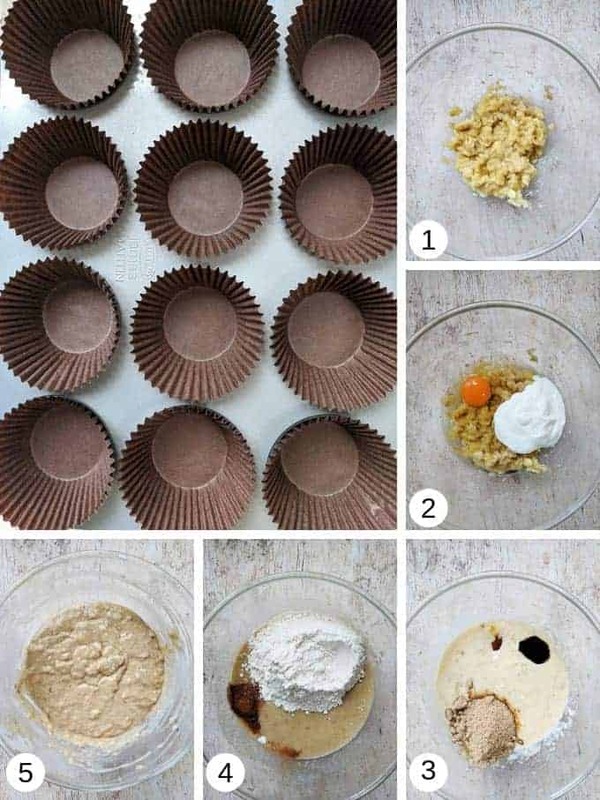 Insert a cake tester or a toothpick into the centre of the muffins - if they are cooked it will come out clean.